Solution for your IT asset tracking needs to gain visibility and control of your IT assets. Landpark Inventory will help you to establish a central asset repository that comprises all of your IT hardware and software components. 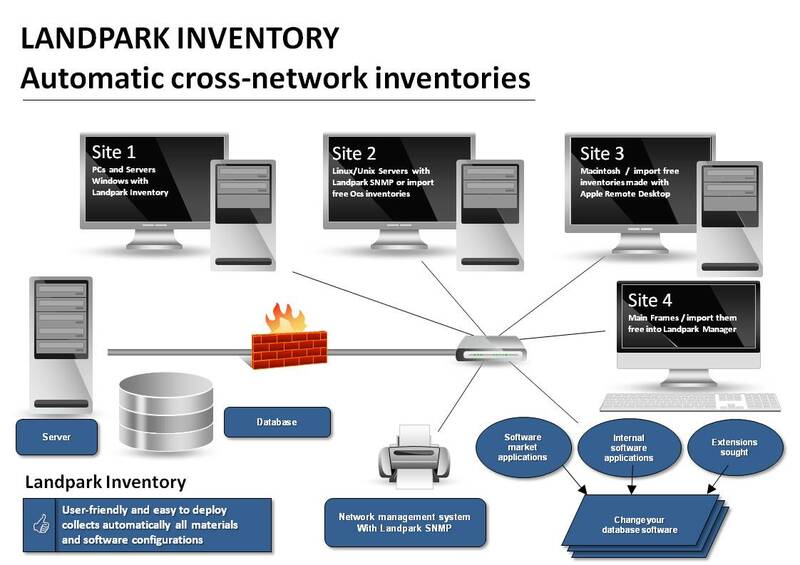 Landpark Inventory will help you to know details such as who uses the asset, what components the asset is connected to and what services the asset would affect in case of a failure, to build your CMDB by creating dependencies across your assets. Approaching data processing systems distributed over several sites requires a strict methodology, supported by inventory systems for fast identification of all your hardware, software and network systems. Your goal is to quickly collect a maximum amount of information - to count your hardware and software systems by using inventory software capable of scanning all PCs across your network. Consolidated in your data-processing management tool - with information updated in real time - your inventory data will allow you a better process management. You will then be able to implement a clear strategy by following up on changes in your data-processing systems. All the information collected on your hardware and software contributes to reduce the purchasing and deployment costs of your data processing systems. Identifying defective components immediately and knowing how to solve each problem is the kind of precise information you need to reduce breakdowns. Your objective is to quickly assess the impact of technical problems and analyze the real costs of your data processing department to finally allow you to concentrate on more important tasks. Landpark Inventory will allow you a better process management. Graphical query tool with Excel exportable results. To help you better understand how to use Landpark Inventory.